Page 24 of 41 for Digital Forensic Science | Tutorials and research about digital forensic science and information security. While the ‘real’ time may be an interesting factor for investigators, what we are more interested in is the time that the program was using the processor. In this case ‘user’ is the time taken by the program in user mode, and sys is time in kernel mode. The basic idea is that we want a program that takes the least amount of time on the processor to do the same amount of work. pHash is an open source software library released under the GPLv3 license that implements several perceptual hashing algorithms, and provides a C-like API to use those functions in your own programs. pHash itself is written in C++. From pHash.org: A perceptual hash is a fingerprint of a multimedia file derived from various features from its content. Unlike cryptographic hash functions which rely on the avalanche effect of small changes in input leading to drastic changes in the output, perceptual hashes are “close” to one another if the features are similar. Ubuntu has a package libphash0 and libphash0-dev, but for this tutorial we will be installing from source. Installation of pHash on Ubuntu (from source). This tutorial assumes you have build tools, like build-essential, installed. <blockquote>The 4th Annual Open Source Digital Forensics Conference will be held on November 5, 2013 in Chantilly, VA. We’ll be sending out updates via e-mail and Twitter at #osdfcon. The conference will be attended by digital forensic investigators and developers. This conference sold out quickly last year, and registration closed early due to fire code occupancy limits. This event is a unique opportunity to make investigators aware of your tools, get feedback from users, meet fellow developers, and help direct the future of open source digital forensics software.</blockquote>Unfortunately, I missed out on the call for papers, but this conference is very interesting and a lot of fun. Highly-recommended! <blockquote class="tr_bq">Digital Forensics and Information Security (DFIS) are key elements for the next generation communication and networking environments where all applications and services are focused on users. In addition, the DFIS has emerged rapidly an exciting new paradigm to provide reliable and comfortable life services. Furthermore, the benefits of DFIS will only be realized if security issues can be appropriately addressed. Specially, forensics for DFIS is very important in the security fields. 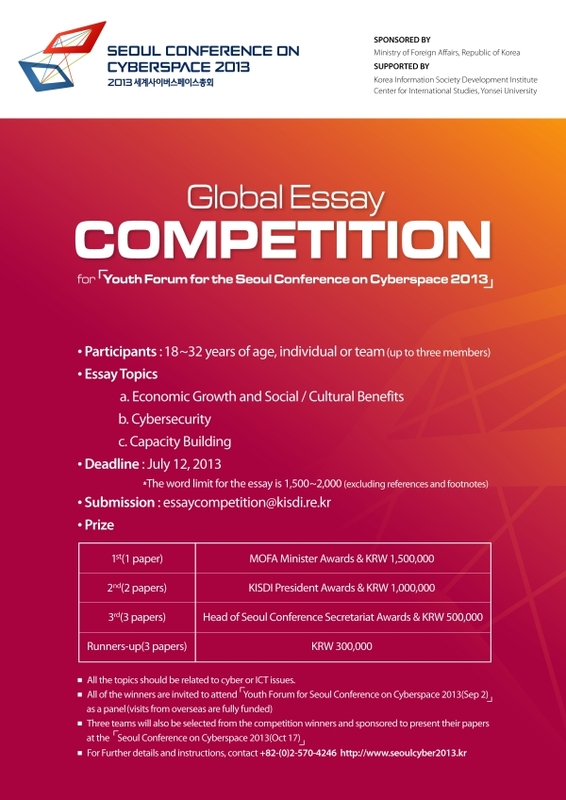 Global Essay Competition for Seoul Conference on Cyberspace 2013 is a special competition, hosted by Korea’s Ministry of Foreign Affairs(MOFA), Korea Information Society Development Institute (KISDI), and Center for International Studies of Yonsei University for youth aged from 18 to 32 across the world. The event forms a crucial part of the Seoul Conference on Cyberspace 2013 (the SeoulCyber 2013); the awards ceremony will be held at the SeoulCyber 2013 Youth Forum scheduled on 2 September 2013 at the Yonsei University, Korea. The aims of the competition are twofold: firstly, to encourage ambitious and talented students all over the world to demonstrate their own ideas on a set of ongoing cyberspace issues; and secondly, to foster their capacities on the purpose of coping with a wide variety of (inter)national cyber threats. Candidates are invited to submit an essay of between 1,500 and 2,000 words (excluding footnotes and references) on one of the three questions below. Submissions must be received by the deadline of 12 July (email entry to [email protected]). Those intending to apply should also complete an application form which is to be included with the submission. Results will be announced by the end of July.